Tenorshare iCareFone (iPhone Care Pro) is a PC-based tool to tweak your iOS Devices to its top performance. This tool is further divided into 6 small tools specializing in fixing certain issues. 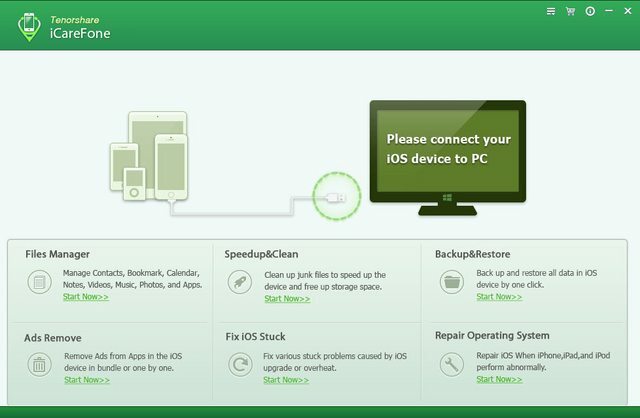 You can fix all kinds of iPhone problems just on your Windows computer after downloading iCareFone (iPhone Care Pro). 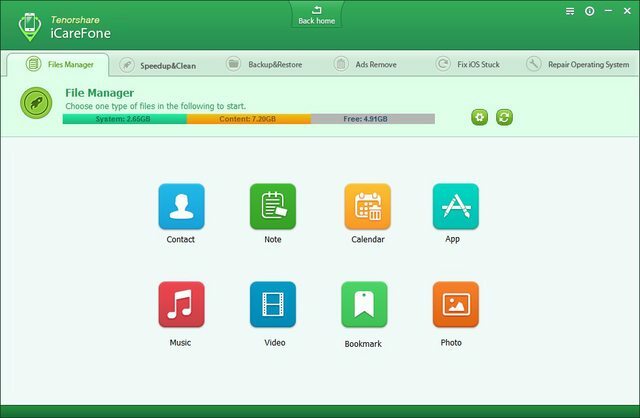 The Files Manager feature of iCareFone (iPhone Care Pro) aims to help iOS users easily manage 8 types of files (Contacts, Notes, Calendar, APP, Video, Bookmark, Photo and Music). You can do a lot of changes with iCareFone (iPhone Care Pro) including edit, delete, add new items and export to computer. With this tool, you can easily share videos, music around as well. Simply connect your device with PC and all the rest can be done within several clicks. Manage 8 types of files: Contacts, Notes, Calendar, APP, Video, Bookmark, Photo and Music. Directly add items to iOS devices. Detect & delete duplicates or unwanted items. Export files from iDevice to your computer. One click to merge duplicate contacts into one. 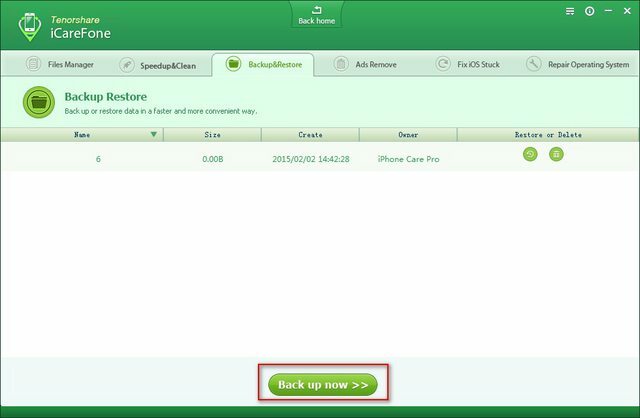 iCareFone (iPhone Care Pro) is an iOS cleanup/speedup tool that promises to clean up all sensitive and overloaded data. It enables you to get rid of unneeded files so that your device could have more free space and the apps runs more smoothly. It provides 2 ways to clean iPhone, iPad and iPod: Quick Clean (FREE) and Deep Clean. Scan for and clean up app cookies, app crash logs, photo caches, call history, iTunes Radio caches and other junk files. 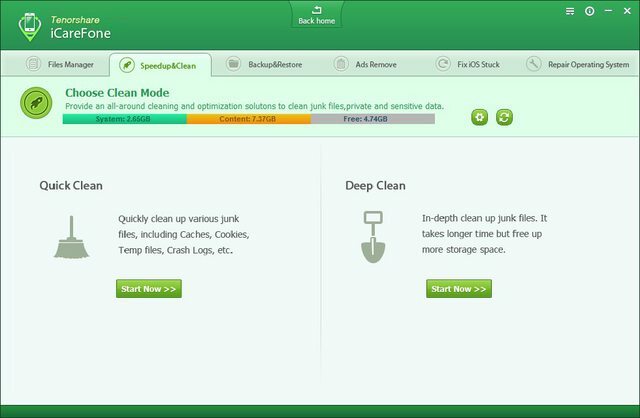 You can decide and set certain types of files to clean by your own and clear all junk files in one click. iPhone, iPad or iPod gets stuck and can't boot properly? iCareFone (iPhone Care Pro) can help you fix all of iOS stuck issues only with one click. 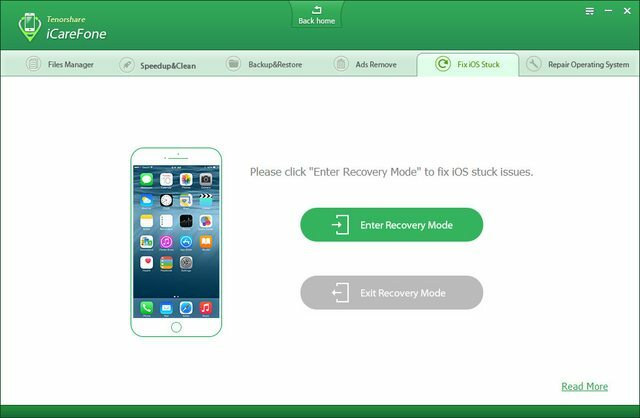 Fix iPhone/iPad/iPod stuck on Recovery mode, DFU mode, Apple logo, iOS freeze, reboot loop, etc. And reboot your device when you need a firmware restore, but Home or Power button doesn't work. "Repair Operating System" function of Tenorshare iCareFone (iPhone Care Pro) provides an easy way to download firmware to fix iOS crash, upgrade failure and any iOS stuck issues. No Data loss. No jailbreak. iOS can't boot properly due to system files loss. Can't receive upgrade notification and fail to upgrade iOS. iOS operating system is damaged severely. Enter and exit recovery mode or DFU mode but iOS stuck issues still can't be resolved. iCareFone (iPhone Care Pro) is a great iOS ads blocker which easily blocks or removes ads and banners in apps on iPhone, iPad and iPod Touch. It creates a totally ad-free environment for your iOS devices. Block ads from all popular apps: Pandora, YouTube, Airborne, etc. Remove only ads. No damage to your apps and no leaking of personal information. Improve system performance of iOS devices to a large extent. iTunes can't recognize your iPhone? Even without iTunes, you can still backup and restore iPhone, iPad and iPod from iTunes backup. Faster than iTunes as there's no need to load all iTunes library when backup and restore. Automatically list all iTunes backups for you to restore from. Delete unneeded backups and save more space on your hard drive. Thanks to Daline Lu from Tenorshare we are able to giveaway five Tenorshare iCareFone Family Packs each (worth $99.95) to our forum members. If you would like a chance to win one of these lifetime licenses, just follow the Simple Rules. 1.Share this giveaway on social media (Facebook, Twitter, G+...) or other forums. 2.Put a reply below including your share link. 3.If you don't want to participate in this giveaway, please don't reply as this creates problems when we randomize winners. 4.PM Mike within 5 days after giveaway ends your email and computer system(Mac or Windows) otherwise your won will be void. This info will be sent to developer to get your license. Please specify the giveaway website as it is a giveaway of promo2day.com and not here!